The New Lyke Wake Club are saddened to receive the news that Arthur Puckrin passed away on 12th July. Arthur first crossed in 1956 when the moors were largely trackless and deserted. He was the first Lyke Wake Double Dirger and first Triple Dirger, he won the Lyke Wake Race four times, was race organiser for a considerable number of years and was a stalwart of the Lyke Wake Club in the early years being the first to present a thesis at a Wake to achieve Doctor of Dolefulness status. Arthur held the record for the fastest crossing and fastest double crossing for many years and his record for the fastest triple crossing, set in the 1960s, still stands. It is clear that without Arthur’s enthusiasm for completing multiple crossings, the early history of the Club & Walk would have been very different. The Club will have a detailed obituary here on the website shortly. Our regular walkers, Tom and Claire Chapman and David Allen have recorded a stunning version of the Cleveland Lyke Wake Dirge, which you can see here on YouTube. You may think that building or adding to a cairn along the way is a harmless pursuit, helpful even, but you could be wrong. Those piles of loose stones might be the remains of something built in prehistory. Building cairns can damage the archaeological evidence. Linda Smith, an Archaeological Consultant working for the North York Moors National Park Authority, has written a special article for us about Walking, Cairn Building and Ancient Burials. In June 2018 dry weather led to an increased risk of moorland and forest fires in the North York Moors National Park. Club Secretary Gerry Orchard helped the National Park Authority rangers to put fire risk warning signs up on key sites advising people what they can do to help to reduce the risk. The signs remained in place until the fire risk had passed. More information on the National Park website. Bernie McLinden (Senior Ranger – Coast Area) and Tom Evans put up a warning sign. The 2018 Wake was held on Saturday 10th March, postponed from 3rd March due to adverse weather (aka The Beast from the East). There’s a full report and a fine selection of photographs on the 2018 Wake page. The 2017 Wake was held on Saturday 1st April (and despite the date there was an excellent turn out). There’s a full report and a fine selection of photographs on the 2017 Wake page. The Club has managed to secure copies of this detailed map of the North York Moors on one sheet at 1:40,000 scale, with the Classic Lyke Wake Walk route illustrated. Tough, light and durable: £15.10, or a special price of £20.21 for the Lyke Wake Walk Guidebook and Harvey North York Moors Map . Head over to the Things to Buy page to do just that. 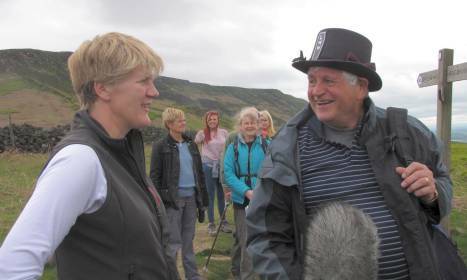 Friday 22nd May 2015 saw a recording on the Lyke Wake walk by Clare Balding for the Radio 4 Ramblings series. A number of Dirgers and Witches gathered for the event and we were even blessed by the presence of an Olympic torch! The programme was transmitted on Thursday June 4th. More details here on the BBC website, or download the podcast (12MB – right click & "save target as / link as"). Our picture shows Colin Walker being interviewed by Clare Balding. There’s a gallery of photos on the BBC website. In 2015 we made a grant to young volunteers who carry out practical conservation tasks in the North York Moors National Park. They now have some new equipment thanks to our donation of £200. 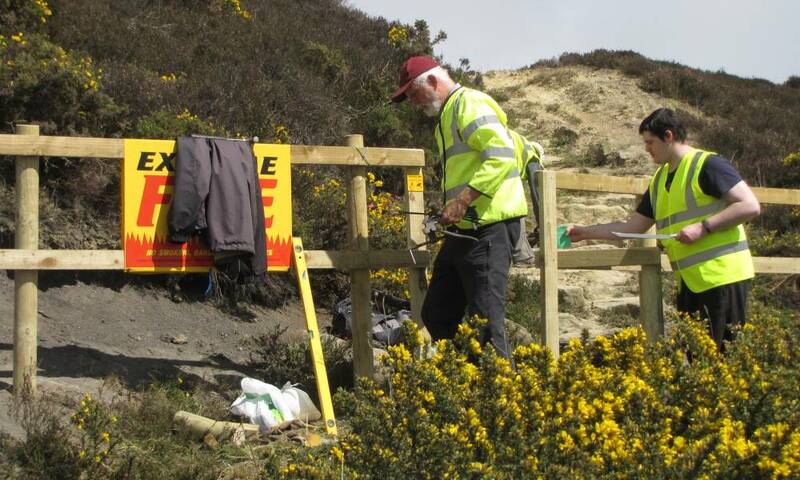 Tools such as spades, trowels and secateurs were purchased to help the National Park Authority’s Explorer Club volunteers carry out their work to look after the North York Moors. More details and pictures here.